Are pre-installed and configured for the hardware components. Click on one of the software packages below to learn more about the software and hardware packages and to order. Retail Edge Version 8.0 point of sale software is designed to provide a powerful cost effective solution for today's retailers. RetailEdge point of sale software provides you with the features you need to run your retail business at an affordable price. As your business grows and becomes successful, RetailEdge will be a system that can meet your needs. 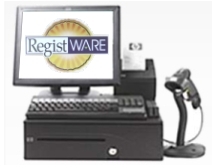 RegistWARE POS Software is designed as a management tool for the independent retailer and is one of the most comprehensive, affordable and user-friendly POS systems available. The simplicity of design, plus wide-range of features and reports, make RegistWARE unique in the POS Software industry. 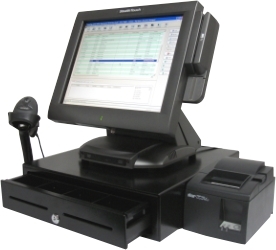 RegistWARE Point of Sale software is compatible with most POS hardware and because of its intuitive design, requires little to no training or support. 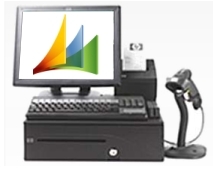 Microsoft POS Software automates POS processes and store operations, provides centralized control for multi-store retailers, and integrates with Microsoft Office system programs, Microsoft Dynamics GP, and other popular applications. Microsoft Dynamics RMS is built on a proven Microsoft platform that adapts to meet unique and changing retail needs. 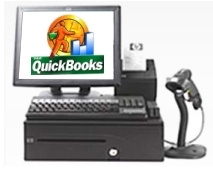 QuickBooks Point of Sale Pro 7.0 automatically keeps track of your detailed inventory, customers, sales orders, layaways, and employee commissions and tips while you ring up sales. QuickBooks can print out price tags, receipts, order forms, and reports quickly with built-in templates. The software handles gift coupon and redemption. Use it alone or with QuickBooks financial software to save bookkeeping time.